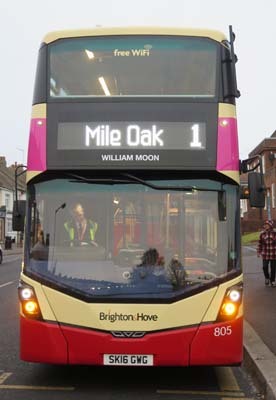 Connections with Brighton and Hove : William Moon was an Englishman who created Moon type, the first widely used practical reading alphabet for the blind. Moon was born in Horsmonden, Kent. As a small child, he lost sight in one eye from scarlet fever, and by the age of 21 he had become totally blind. 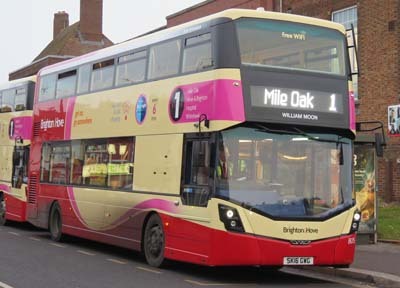 He moved in with his widowed mother and sister in Brighton. He became a teacher, and taught boys how to read using the existing embossed reading codes. Moon realised that the boys found these reading codes difficult to learn. He devised a new system, Moon type, based on a simplified Latin alphabet, which he designed to be easier to learn. He first formulated his ideas in 1843 and they were published in 1845. Moon type was subsequently replaced in popularity by Braille but it is still important for people who have difficulty reading Braille. Moon achieved several distinctions during his lifetime. He was elected to fellowships of the Royal Geographical Society and the Royal Society of Arts in 1852 and 1857 respectively. He was also awarded an honorary LLD degree by the University of Philadelphia in 1871. Born in 1818, he died in 1894. 805 Mercedes Streetdeck on Route 1 - carried name since December 2016.